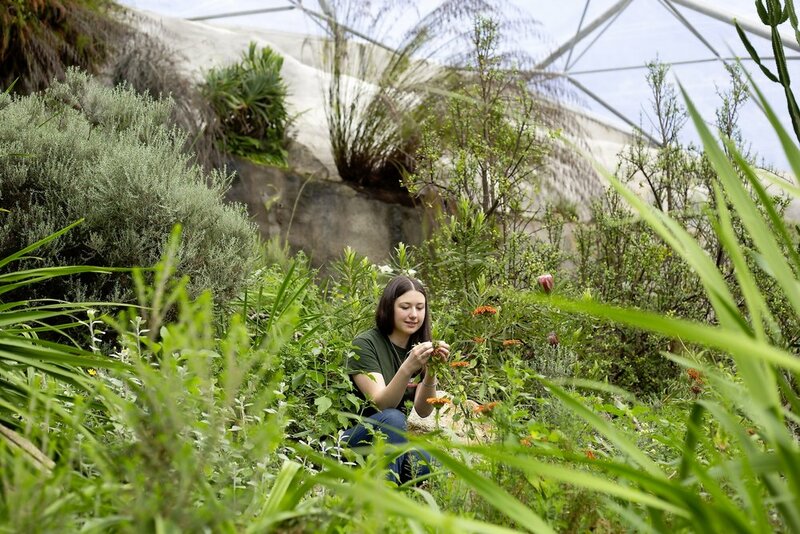 Although Fern Carroll-Smith currently looks after the Seed Bank at Cornwall’s Eden Project, she’s passionately involved in supporting the educational charity’s first National Plant Collections, both devoted to kniphofia (or red-hot pokers) and achieving national status in 2018. One is of garden hybrids and species possessing the RHS Award of Garden Merit (AGM), currently spanning 72 different types, while the other is a 22-stong group of species and wild varieties. While the species collection is currently in large pots, awaiting planting out, all the varieties are displayed in Eden’s ‘Bright Sparks’ bed, among other bright, summer-flowering perennials, such as crocosmia, hesperantha and ornamental grasses such as miscanthus. Kniphofia are valuable garden plants with a long season of interest, both individually and collectively. At Eden May-flowering lime-yellow ‘Dorset Sentry’ is one of the first, while flame red and yellow ‘November Glory’ blooms from October onwards. “I love to see Kniphofia in any summer border. They are beacons of light, on even the greyest day and always accompanied by the humming of bees, attracted by the abundant nectar. We found that bees really love the variety ‘Painted Lady,” said Fern. She finds most kniphofias easy to grow, as long as the plants are in sun, in moist, well-drained soil that doesn’t become too droughted, with varieties on balance easier than the species. Eden is also making breakthroughs with propagating kniphofia, with a research student having some success micropropagating them from flower buds, rather than growth points, a technique far less risky than sacrificing a growing point. “We’re also hoping to obtain more varieties not found in the UK, especially from the USA and we’re always looking to increase our tally of species,” said Fern. You can help preserve unusual plants in your garden! The Plant Heritage charity works to conserve the nation’s garden plants through the National Plant Collection Scheme and Individual Plant Guardians, and is looking for Garden news readers to get involved with its crucial work. Contact collections@plantheritage.org.uk for more information or visit www.plantheritage.org.uk.